A Lady Reveals Nothing: Meeting the New Neighbors! Finally! 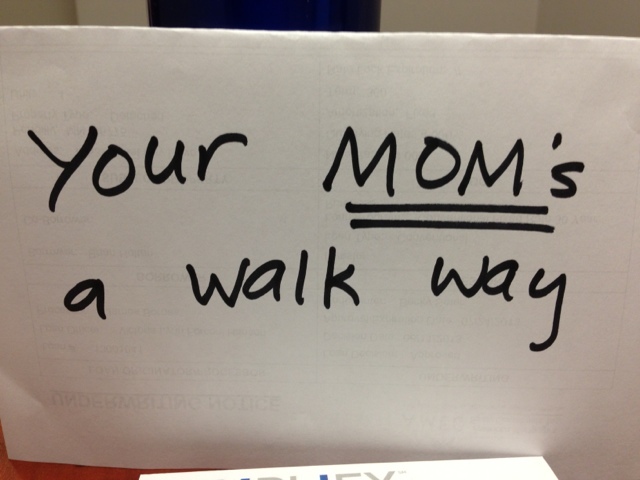 All I've got to say is, your handwriting is very similar. There is another way to interpret the note. 2. She sees herself as an idiot, in which case it's clear her self-esteem is dangerously low, and she deserves your pity, not your wrath. Poor thing. 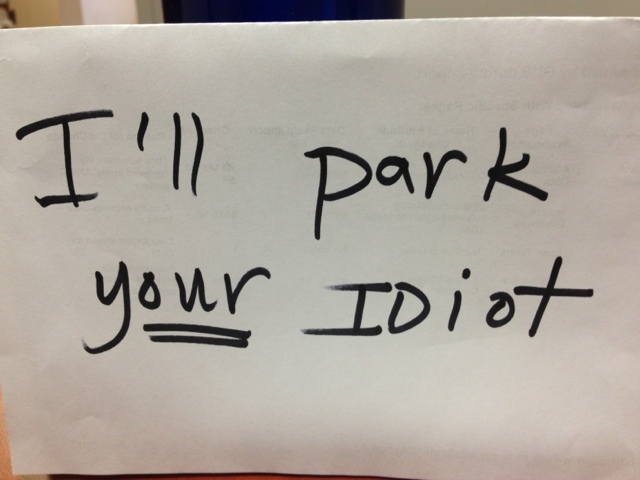 In either case, the correct response is to stop parking your car in front of the walkway. If you time it right, you should be able to park on top of your neighbor instead. Flaming bag of poo. It's a classic. Burn her a CD, which may be too futuristic for her, of fun little walk on or driving songs. A couple Of them could be Walk on By, Drive by The Cars, These Boots are Made for Walkin' by Nancy Sinatra, or even Deadman's Curve. Maybe you should include Mr. Roger's Won't You Be My Neighbor to soothe The Bridge Over Troubled Waters. Good luck Lady. I know that two wrongs don't make a right and that we should kill with kindness blah, blah, blah. But people like that, that are insanely rude without provocation, make me so angry. I say burn the place done and park on the ashes. Jared has a point, but i see it differently. 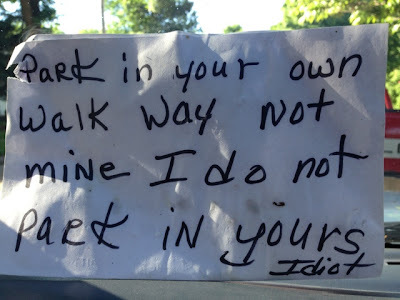 I picture her writing the note, all but the last word, then leaning back in her chair thinking about you in general (not just the parking situation) and finally feeling she has "grokked" you completely adding the final word. ps. i use the word "grok" only to expose Jared as the SfFi nerd he is. it will almost certainly draw him out. Grok...funny. You're right, of course, like the honey badger, drawn by the delicious [though temporarily soporific] cobra, I cannot help but rise to the bait of a Robert A. Heinlein reference, much less an allusion to his masterwork. And now, having been drawn out, I must return to my nerd cave to complete my annual reading of "Ender's Game".